Interesting stuff. I know pathetically little about meideval politics for a medieval historian. It's important to note though that Edward had been considered a Saint and a model of saintly kingship long before Richard II - the Vita Edwardi Regis was commissioned by his widow and is clearly an attempt to promote his cult very soon after his death - the actual process of canonisation tended to operate more on consensus than any formal process at that stage. Also, the vikings didn't assassinate Edward of East Anglia - they killed him in open battle. The assassination story is the product of the myth that grew up around him and is another instance (much as with Edward) of an attempt to present an image of a saintly king marked by his passivity and trust in God in the face of adversity. The actual death scene is lifted straight from various Lives of St Sebastian. OK, I'll stop being such a medieval pedant/defender of the vikings. Oh no continue being a pedant! 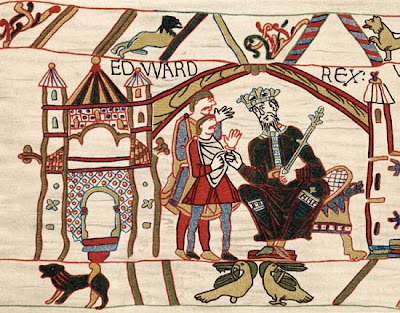 I didn't know that about Edward of East Anglia- the myth though is really important in considering the place of Christian kingship in England and you are right it ties straight into the confessor myth which I think is key- I don't think the fact that three medieval kings were named Edward is a coincedence! The Confessor you are entirely right about- the legend of him being a saint starts with the VER and goes on afterwrads. Its potency as a myth for the opposition to kings is well known- but Henry III, Richard and others used it as a model of sacral kingship which I think is important- I do think its Ullman's idea of a descending theory of govenrment from God to the King to the people and Edward's personality buttresses that- as does the fact that it legitimates his grant of the Kingdom to William who is the first Norman king and the ancestor of all the other kings of England.